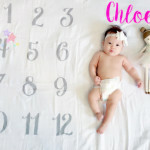 CHLOE: 8 MONTHS OLD | Beverly's Net: family. food. fashion. 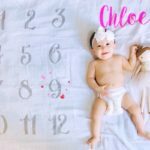 CHLOE: 8 MONTHS OLD – Beverly's Net: family. food. fashion. 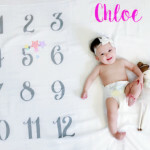 Somehow, this month flew by so quickly that I only just realised Chloe is 8 months old! I’m in a perpetual state of sleep-fogginess (thanks to Hunter’s 6am wake up for school every day), so I’m blaming my fuzzy state of mind for forgetting her monthly birthday. This (above) is still her default face. She’s a non-smiley baby through and through, much like her eldest brother Hunter, who was famous for his patented death stare. She doesn’t death stare, but simply…. regards people. She can win any staring competition – hands down. But this is my view. 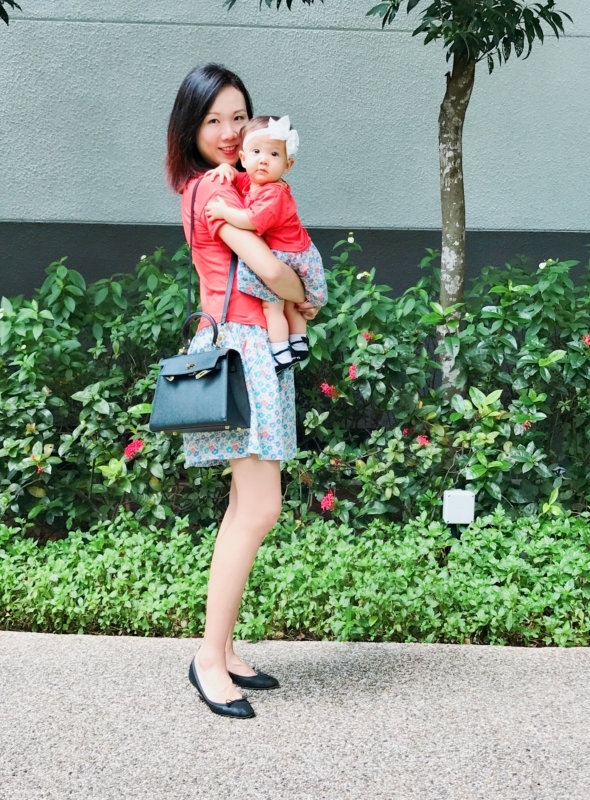 I get the big doe eyes and “I love you mama” expression, so I’m happy 🙂 I suppose the benefit of having a pint-sized baby is the ability to baby carry her – something I didn’t do with my boys because they were so freaking gigantic. Her brightest smiles are reserved for one very special person.. her Daddy. She eagerly crawls to him when he comes home from the office, and will crawl around to seek him out. Her little squeals of pleasure and baby coos to him (to get his attention) is seriously cute. 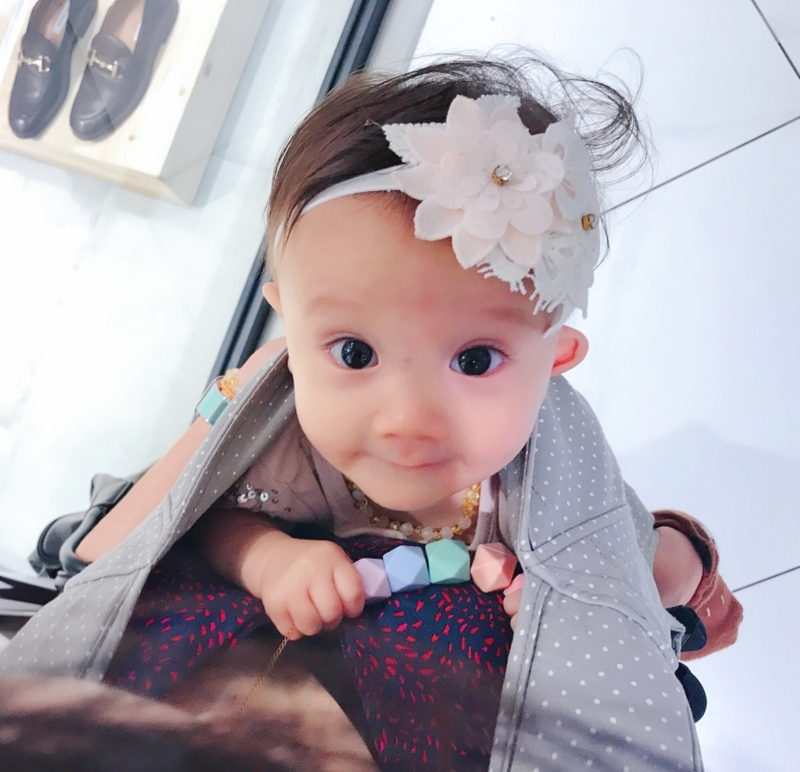 It’s also remarkable how a tiny baby girl can bring a grown man to his knees with just one glance 😉 I need to take lessons from her. Chris gets the full I-will-throw-my-arms-happily-around-my-daddy hugs and full body pleasure wiggles! And me? I get her love, but it’s different. It’s more of a calm, I-wanna-curl-up-in-mama’s-arms.. and I’m her default favourite person because I’m the walking milk machine, natch. This kid is a food monster! She astounds all of us with her appetite. 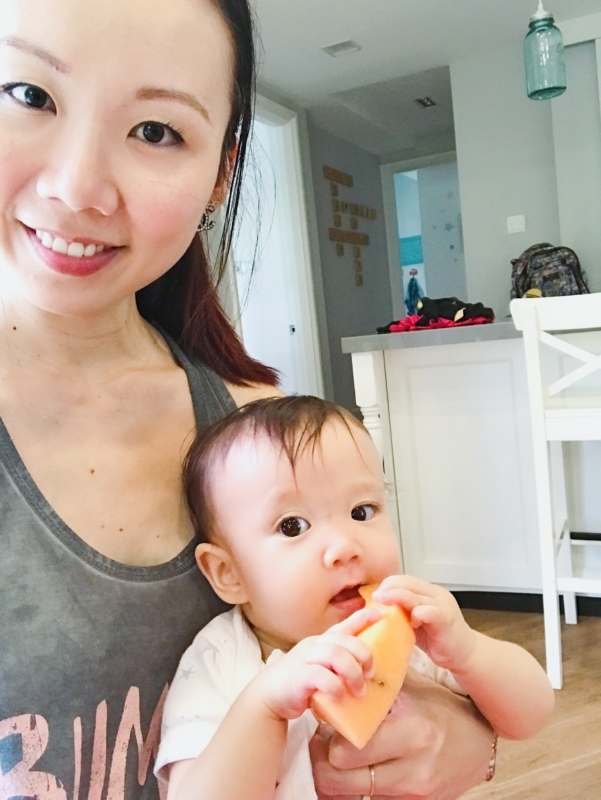 She’s nursing 6-7 times a day and has 2-3 solid meals (120ml each, eaten within 10 mins) a day.. and yet is on the 0 percentile for weight. Her food input is actually more than the average baby her age (and much more than her brothers did), but she is incredibly interested in food and will have a meltdown if she spots us eating and she’s not. 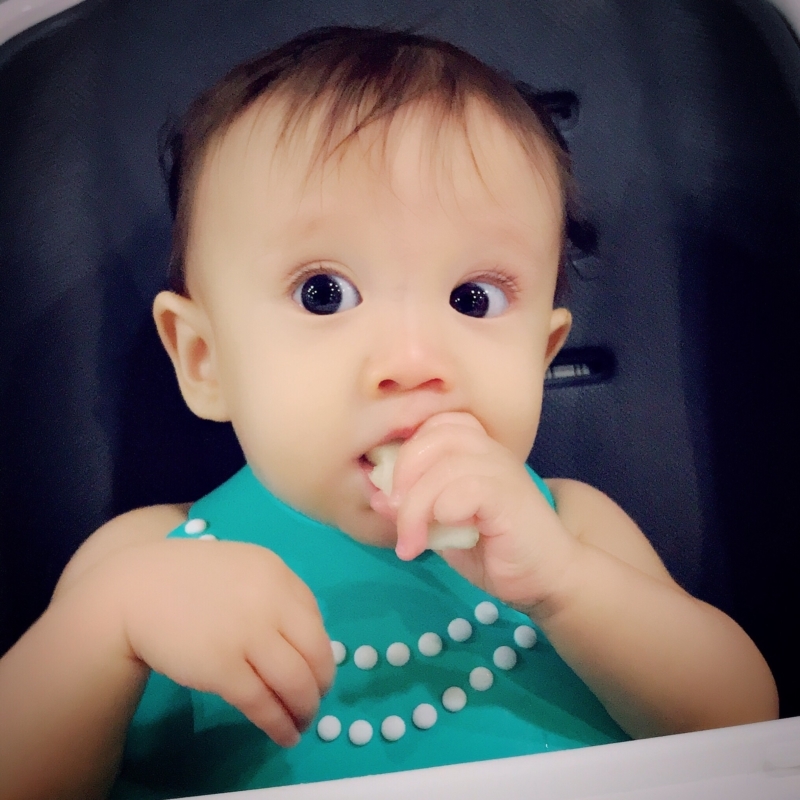 Because of her eagerness for food, she’s majorly into baby-led weaning, something I never quite did with my boys. She’s had so much food off our plates – pretty much every type of fruit, bits of grilled fish, omelette, even hummus!! This means I always have a packet of her baby biscuits with me, because I need to whip them out for her if she spots me eating lunch when we’re out. This usually works, unless she finishes her biscuits and I’m still eating, then she’ll insist on eating the food off my plate. 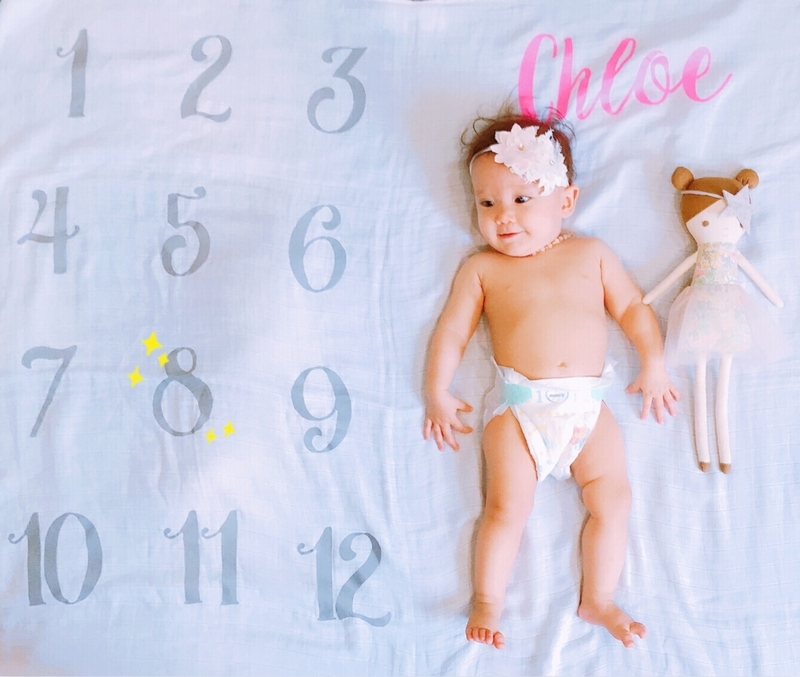 Like I said, we are all surprised she’s so tiny and 0 percentile, and not the size of a house…. Could be because she poos 3-4 times a day (!!!!!). Yep, my life these days is all about cleaning up crap. She’s roughly settled on 3 naps a day.. which are all unfortunately too short. She only naps 30-45mins and can’t get through to another sleep cycle unless she’s baby carried. She’s awake the rest of the time, and demanding to be carried around. Only child of mine to be so demanding, attention-wise. I reckon she was born to be an only child, or at least a first-born! She has 1 middle-of-the-night feed, which is destroying me because I need to be up at 6am to get Hunter ready for school. And if she has a bad night (ie. growth spurt), I’m down to about 4 hours sleep. I don’t even know what it feels like to have a solid sleep any more.. and sometimes I’m honestly surprised I can sound vaguely coherent and not stumble out of the house in pyjamas. It’s true, what they say about younger siblings being eager to grow up. Everything about her just screams I just wanna grow up already! She crawls, super fast. She only wants to play with her brothers’ (baby un-friendly) toys. She wants to hang out with them all the time. And she can pull to standing now, with so much glee! I find this milestone so bittersweet.. as it truly marks the end of a baby’s “baby-ness”. 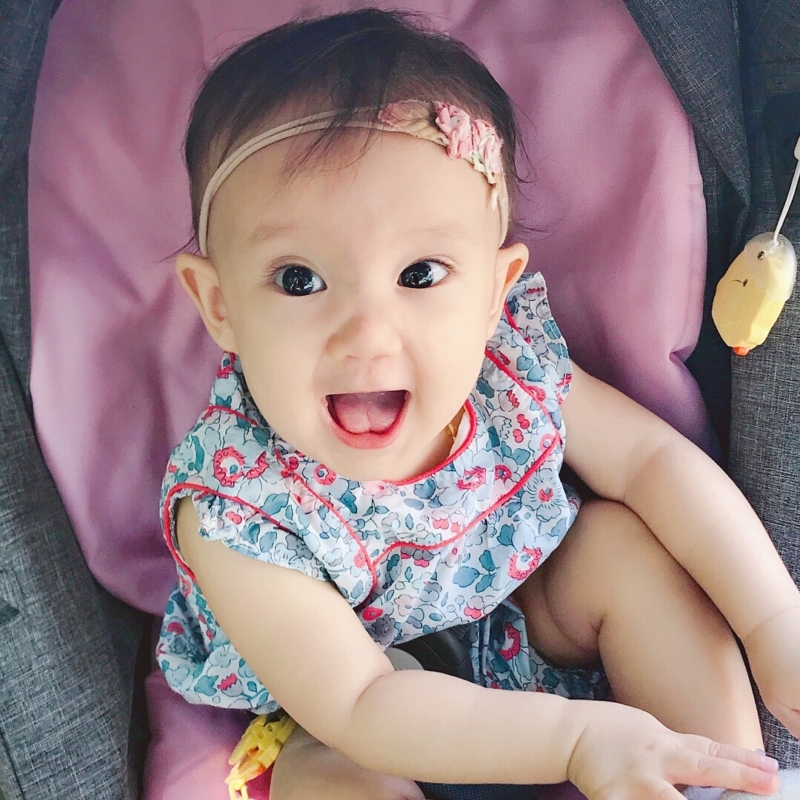 Has it really been half a year, since she was immobile and lying down – a newborn? And she had her first swim! 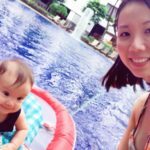 I was anticipating her having a bit of a scream, but she loved the water. She doesn’t seem to notice even when it’s cool and windy out, she just paddles her lil legs furiously and ‘swims’ around in her baby float! I suppose she’s a water baby just like her brothers. Swimming probably ranks right up there as one of her favourite things to do. And it’s a great way to tire her out, since she has tons of energy. She’s only been on this earth for less than a year, but has claimed #1 spot in all 3 boys’ hearts. In particular, Hunter’s. Their love is still going strong, if not, way stronger than ever! 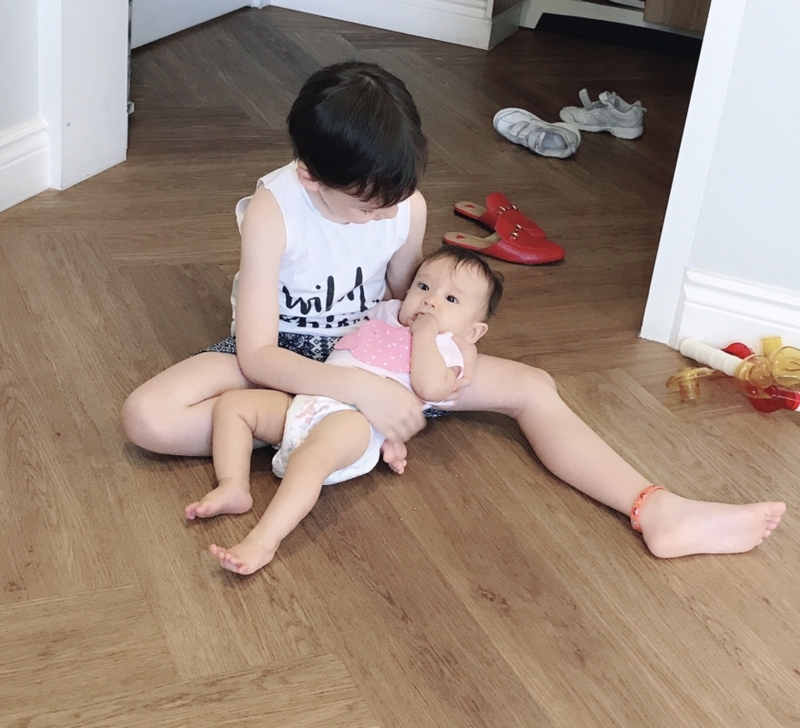 They rush toward each other, luxuriate in all their cuddles, and he’s now learned to pick her up and carry her around… so he keeps doing that until I have to beg him to stop and let her stay by herself in one spot! She’s the boys’ personal doll and seems to relish being one. Conversations between siblings. She adores her brothers so much it’s crazy! She could spend hours staring at them playing, probably wishing she could grow up quick already, so she can play too. 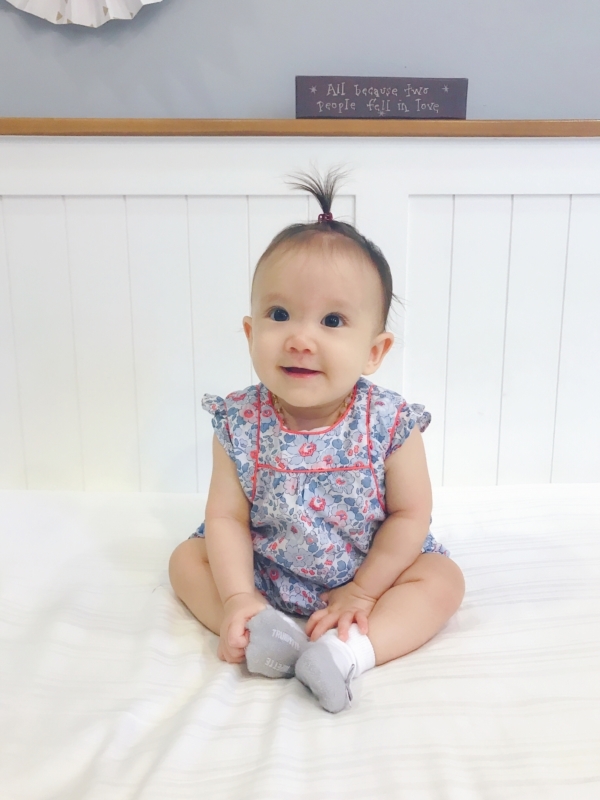 Our pint-sized doll is growing up fast! She’s finally, finally outgrown her 0-3 month baby clothes, and fits comfortably in 3-6 month clothes now. 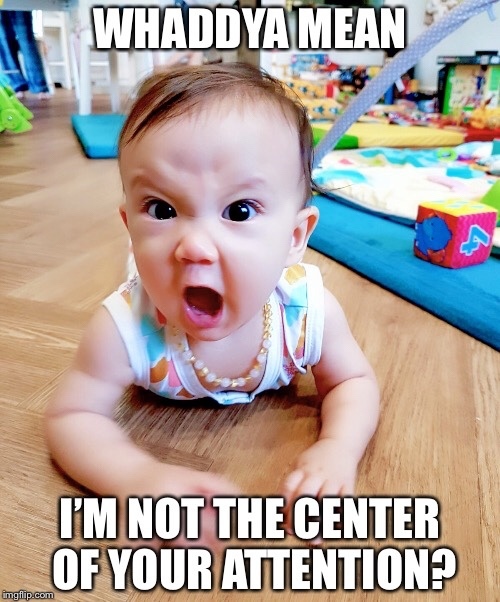 But though she be little…. she be fierce. VERY fierce! That’s her typical face above, if she’s not getting enough attention, or left alone for too long (ie. more than 5 minutes). She’s totally attached to me, and I’m not ashamed to say I secretly love it. My boys grew up real fast when Chloe came alone, and now don’t like me cuddling them or calling them “baby”. 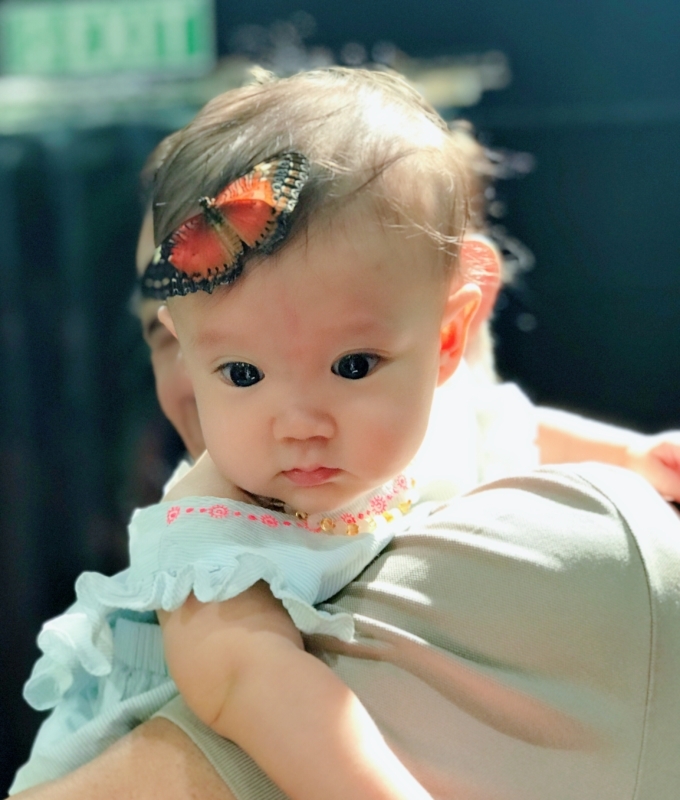 So, at least I have her to channel all my baby-lovin’ to! The cuddles are PLENTIFUL with this one, and I’m enjoying each and every one. I hadn’t realised how much fun it would be to dress up a baby girl, but dang, it’s FUN! I absolutely love this family photo, except for one teeeeeeny problem. Hunter’s missing! I had already sent him to school at the unGodly hour of 7:30am, so everyone was still lounging in bed. 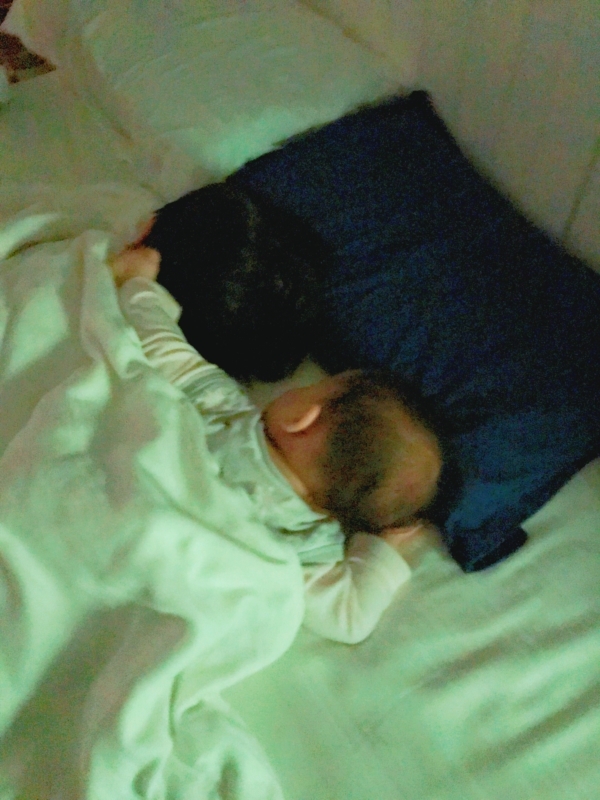 Thus this impromptu shot that Chris snapped with his phone…. which perfectly captures our morning mood – beautiful sunlight streaming in, cosy in our bed in a cool room, with our kids piled in. 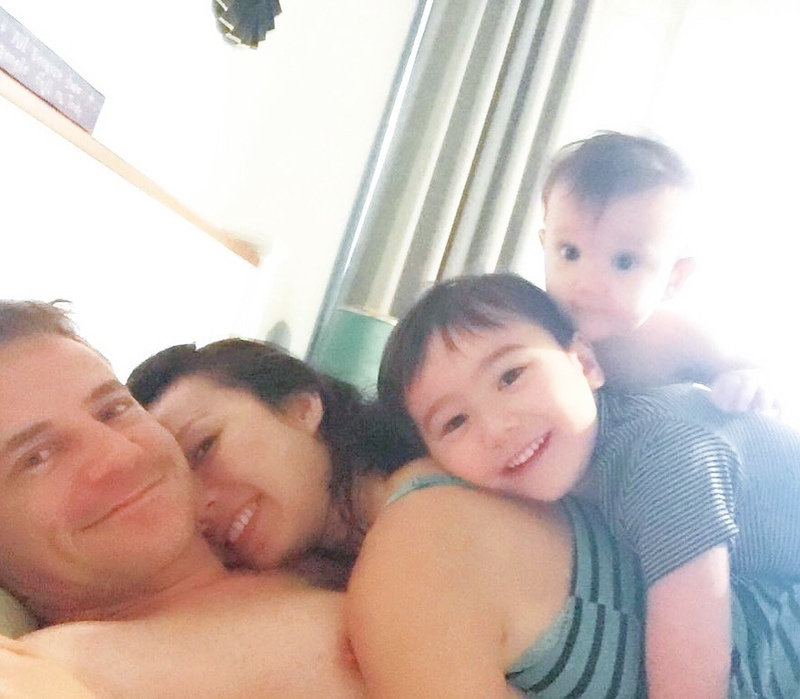 Carter wanted “a Burgess family sandwich”, hence this is what he got 🙂 We totally need to re-create this with Hunter around too, though I’m not sure Chloe can climb to the top of the stack then! Compare with Hunter’s 8 month post here. Compare with Carter’s 8 month post here. Next WHO DID IT BETTER?